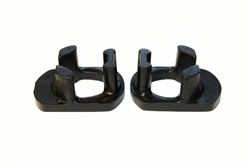 Torque Solution Porsche Engine Mount Inserts are designed to limit the amount of engine movement under on off throttle and braking conditions. The factory mount allows the engine to move which gives the feeling of a sloppy drivetrain. The mounts will give the car a more direct feel and more precise driver input to the vehicle. You can expect a much better feel under Braking, Acceleration, & lateral G's. While typically most " Race Cars " use a SOLID MOUNT, this solution is less harsh and still maintains better control of the engine movement without the issue of Solid Mount Vibration. Why replace your broken mount with the same rubber mount that will break again due to deteriorating rubber. Replace the worn rubber with Limited Lifetime Warranty Polyurethane Inserts! !